Here’s my analysis. I have a more detailed critique of anti-development politics in my book, Generation Priced Out: Who Gets to Live in the New Urban America. SB50 largely ends the notorious exclusionary zoning laws that allow new mansions but ban apartments in even heavily tenant cities like San Francisco. The bill encourages new housing on or near transit corridors, a critical strategy for reducing the long car commutes that worsen climate change. Overall, SB50 offers California its best opportunity in generations to jump start housing development, a critical need in a state that is the national leader in unaffordability. So why would tenant groups oppose it? I’ll address Berkeley, Oakland and Los Angeles after starting with San Francisco. Virtually nothing in that email quoted above is true. As my book explains, the vast majority of San Francisco’s “luxury housing”stock —meaning a sales price of at least $1 million—is existing single family homes. Not newly built units. Luxury single family homes have been on steroids for several years due to the artificial restrictions on housing supply that SB50 eliminates. “No requirement to build affordable housing”? San Francisco’s inclusionary housing and density bonus laws that require affordable units apply to SB50 projects. I’ve heard people say that builders will only construct eight unit buildings to avoid inclusionary requirements but if that were true we would already see similar sized buildings across the city. Yet that has not occurred. Builders will construct as many units as fit the site. In the extremely unlikely scenario that a post SB50 wave of eight unit buildings follows, the Board of Supervisors can simply amend the inclusionary law to include such structures. The truth is that by expanding multi-unit buildings throughout the city’s Westside and other neighborhoods long off limits to all but mansions, SB50 will dramatically increase the number of affordable units in San Francisco. And thousands of tenants will get to live in the city near their jobs instead of having to commute from Sacramento, Vallejo, Stockton or Tracy, as is now too often the case. The “community gets nothing in return”? Also not true. SB50 creates the increased economic and racial diversity these neighborhoods (and the supervisors who represent them) claim to desire. Neighborhoods are better when teachers, service workers and other working and middle-class people live there, not just the well-heeled. “Luxury housing development”? The often repeated claim that “luxury development” has driven gentrification in San Francisco is false. To the contrary, as I describe in my book, once working-class neighborhoods like Alamo Square, Noe Valley, Bernal Heights, the Haight-Ashbury, North Beach, Potrero Hill, the Castro, Inner Sunset, and the Inner Richmond all became upscale enclaves without almost any new market rate housing development. Why did these neighborhoods begin gentrifying in the late 1970’s? Because local homeowners responded to increasing population and job growth in the city by enacting and enforced exclusionary zoning that banned or limited new apartments. Instead of building more housing, San Francisco in the 1970’s and 1980’s built less. The city did exactly the opposite of what it should have done, all while maintaining a weak rent control law that actually promoted gentrification and displacement. These now luxury homeowners gave nothing back to the city in exchange for maintaining exclusionary zones laws that caused their property values to skyrocket. And its a new generation of priced out millenials bearing the cost—in the form of skyrocketing rents and home prices– of these homeowners’ profits. Preston, the SF Tenants Union and other groups are fighting to maintain zoning laws that openly and legally tells the non-rich that they have no right to move to most San Francisco neighborhoods. SB 50 changes this. SB 50 opens all neighborhoods to working and middle-class tenants because the city’s inclusionary housing law requires 20% of new multi-family units—which cannot be built now because the zoning prevents it— to be affordable. And the 80% that are market rate will rent or sell for less than the neighborhood’s existing housing stock. Some oppose 80% market rate projects. Even though 20% of the units will allow teachers and other workers otherwise priced out of San Francisco to live in a very desirable community. I think this 20% means a lot for the families benefiting and San Francisco’s future. The city needs new working or middle-class residents across the city to maintain economic and racial diversity. Expanding housing for a new generation of the non-rich should be the pro-tenant position. The tenant agenda has to protect existing longterm tenants and open the doors to the next generations of renters. The luxury homeowners leading the fight against SB50 and who oppose apartments in their neighborhoods love the idea that they are battling for the working class against “greedy” developers. I’m sure Preston’s email struck a chord with them (my book highlights Preston’s record as an attorney fighting displacement under the Ellis Act). Barring future working and middle-class residents from a majority of San Francisco neighborhoods is not “progressive.” Nor is it “pro-tenant or”pro-working class.” I’ve been waiting for years for tenant advocates opposing market rate housing to have a plan that addresses job and population growth in the city. They promote “100% affordable housing,” but teachers and others who are priced out of San Francisco rarely qualify for such projects. Nonprofits typically target those with lower incomes. And those claiming “SF should only build 100% affordable housing” agenda ignore the biggest obstacle to this outcome: zoning laws bar such housing in most of the city. And as I wrote last week (“SB50 Exposes SF Supes’ Failed Housing Vision“) neither tenant groups nor “progressive” supervisors have ever made a move to change such zoning. They are happy to use the “100% affordable or bust” line to oppose market street projects while doing nothing to legalize affordable projects. After all, city tenant groups back “progressive” supervisors politically aligned with the luxury homeowners that support zoning restrictions and dominate voting in many districts. Even if San Francisco passes November’s proposed $500 million affordable housing bond, all of its funding for middle-class housing will be restricted to less than half the city where new multi-unit projects are allowed. Some would call this segregating the non-rich. But San Francisco is a progressive city that opposes segregation so we will have to find another term. “Progressives” opposing SB 50 on the grounds it promotes “luxury housing” have no problem with real luxury housing. Progressive supervisors backed both Rincon and Millenium Towers, two of the cities most expensive properties. Both those projects were built solely for the wealthy. Progressives also backed the elite 30 story Intercontinental Hotel at 5th and Mission that expanded the gentrification of SOMA west of Fifth Street. The only tenant group opposing the latter project was the Tenderloin Housing Clinic (which I head). “More displacement of working-class communities”? I’m not sure how Preston defines such areas. The two that clearly fit the bill, the Tenderloin and Chinatown, already allow apartments. The Tenderloin’s longtime 80-130 foot height limit exceeds what SB 50 would impose. The Tenderloin confirms that allowing 8 story buildings does not cause gentrification. The Mission is often described as “ground zero” in San Francisco’s gentrification wars. I describe in Generation Priced Out how Mission activists had great success holding off displacement and gentrification until their efforts were overwhelmed by the dot com boom. The Mission’s anti-gentrification efforts now focus on building and acquiring affordable housing, as the working and middle-class have long been priced out of vacant apartments and single family homes. Thanks to aggressive activism, 1100 nonprofit affordable units are in the pipeline. According to the city’s planning department, the decline in the Mission’s Latino residents has stalled. When it comes to SB50, the Mission already allows the apartments and increased density provided by the measure. SB 50 will primarily impact the Mission by reducing future market rate developments as new building opportunities become available on the Westside. The law allowing live-work lofts in former industrial areas passed under Mayor Art Agnos in 1988. There were no nearby homeowners to prevent such housing since lofts would be built in industrial-zoned areas where no homeowners lived. Loft construction took off in the late 1990’s when the South Bay’s dot-com book brought new money into the San Francisco housing market. Live-work lofts became the greatest source of middle-class housing in modern San Francisco, enabling middle-class tenants to become owners as prices were far less than existing single family homes. I strongly supported lofts primarily for their creating an alternative buying opportunity for tech workers who had flooded San Francisco and created an Ellis Act and owner move-in eviction nightmare. I felt most buyers preferred new units where there has not be an eviction to create a vacancy, but that they were willing to buy an older unit if the lack of new housing supply made a former rental unit there only buying option. So I encouraged my friends at the Residential Builders Association to keep building lofts. I wrote a 1999 New Mission News story (detailed in my book) showing that there was no geographic connection between live work loft construction and Ellis and owner move in evictions. Yet most progressive activists strongly opposed live-work lofts. They blamed the new housing for gentrification and displacement, even though the high profile Ellis evictions during that time were occurring in North Beach, where no luxury housing (or virtually any housing) was being built. After “progressives” won control of the Board of Supervisors in the 2000 election, one of their first acts in 2001 was to kill new live work-lofts. A telling sign of how San Francisco sacrificed middle-class housing needs for an anti-development agenda—despite rising population and jobs growth. What was remarkable about the dot-com boom era (1997-2001) is that progressives offered no strategy for housing the tech workers moving to San Francisco because South Bay cities refused to build. We had a huge influx of workers driving up prices on vacant units and creating a buyers’ market for Ellis Act and OMI evictions and all tenant groups did was try to strengthen tenant protection laws. I was part of that effort and we succeeded in passing strong new protections. But this could not stop rising prices and evictions in the fact of huge job growth occurring outside the city’s control. What was under the city’s control was to build a lot more housing to deal with the jobs/housing imbalance. But that did not happen. And in 2012 when a new tech boom brought thousands of new jobs to San Francisco, the activist response again was not to build housing for these workers—it was to blame young tech workers themselves for causing a new housing crisis. San Francisco’s real engine of displacement and gentrification has been its failure to build housing to meet jobs and population growth. This anti-housing agenda has priced out a new generation of working and middle-class residents and turned the city into a national poster child for unaffordability. The failure to build housing has also exposed longtime tenants to greater risk of displacement under the Ellis Act or owner move in evictions. As I have said for decades, buyers want to buy. San Francisco either provides a supply of new condos for them to move into or they will become an expanded market for units vacated by Ellis Act evictions. The best way San Francisco can reduce speculator evictions under the Ellis Act is to build a lot more housing. Tenant activists and local council members/supervisors are most engaged at the local level. That’s where they have their power. Tenants understandably become wary of a state law overturning exclusionary zoning, connecting it to the landlord power grabs of Costa-Hawkins and the Ellis Act. Los Angeles Council members (who voted unanimously to oppose SB50) and San Francisco Supervisors (who voted 9-2 to oppose) both depend on the votes of homeowners who want to keep apartments out of their neighborhood. Local politicians helped build the housing crisis, so there is no reason to expect these same politicians to fix the problem they caused. I see the test of whether local or state control is best as based on which better promotes housing affordability. The state’s intervention into rent control laws is bad because it worsened affordability; SB50’s state preemption is good because it promotes more affordable homes. The civil rights community knows well not to worship at the false idol of “local control.” Cities pledged to end racist and class-based exclusionary zoning when they opposed SB 827 a year ago; but after they defeated the bill they did nothing. We will not end exclusionary zoning in California’s major cities without state preemption. And given that the state under Governor Newsom is about to invest big in California housing, the state has a right to ensure it gets its moneys worth. Anti-SB50 sentiment by tenant advocates is also clearly fueled by its identification with Scott Wiener. Wiener was backed by the pro Ellis-Act Small Property Owners when he defeated Rafael Mandelman in the 2010 D8 supervisor’s race. He became aggressively pro-landlord after taking office. Wiener was also in a major fight with progressive activists over the leadership of the San Francisco Democratic Party; he was ultimately replaced by Aaron Peskin in a classic “which side are you on” political fight in San Francisco. We knew what side Wiener was on: real estate’s. And no tenant advocate was going to join him in a fight. I got into huge rows with Wiener when he was on the Board and was among the tenant advocates deeply disappointed that he beat Jane Kim in the 2016 State Senate race. I never expected to supporting any legislation he would introduce. But a politician once impervious to housing inequality is now backing far ranging legislation to open gentrified neighborhoods to working and middle-class tenants. He is also far more supportive of tenant protection measures than he was as a supervisor, which he will confirm once the votes start on the many such measures before the legislature. I say in The Activist’s Handbook that activists should pursue their agendas, not politicians. They should back those who support their ideas even if they have been in opposition on other matters. So I have no problem putting aside past major differences with Wiener and supporting a bill encouraging new housing for working and middle-class residents in high-priced cities. But if supporting a Wiener-backed bill is too far a step for some tenant advocates to cross, focus instead on SB50’s chief co-sponsor, Senator Nancy Skinner. Nancy Skinner has been backing tenant causes since 1978, a fact I can verity because we met working on a tenant ballot measure in Berkeley that year. Skinner has a long and consistent history of supporting tenants, a lot longer and more consistent than leading SB50 opponent Michael Weinstein of the AIDS Healthcare Foundation. Weinstein’s attacks on SB 50 always focus on Wiener and ignore Skinner. Could it be that the pro-tenant Skinner’s zealous support for SB50 will convince people that it must be pro-tenant? And that Skinner, who was talking about climate change even before Al Gore, recognizes that infill housing is a core environmental issue? I discuss these cities in my book and here’s my basic sense of why tenant groups also oppose SB 50. Most oppose SB50 due to its encouraging market rate housing. Los Angeles has a local transit oriented development measure that tenant and transit groups feel SB 50 puts at risk, but the core opposition to the bill comes from the same homeowner groups whose anti-housing agenda has caused the city’s extreme unaffordability. Check out the discussion in my book of Los Angeles’ upscale and “progressive” Venice neighborhood. It gentrified entirely without new luxury development. Highland Park went from low-income to gentrified without new development. The city’s entire Westside gentrified in the 1980’s prior to any new development, and the lack of new housing pushed the middle-class to then affordable and now gentrified communities like Eagle Rock, Silver Lake and Los Feliz. I hope nobody believes Berkeley gentrified due to excessive luxury development. The major new housing is primarily downtown, with the city’s homeowners keeping apartments out of their neighborhoods. Oakland’s Rockridge, Temescal and Adams Point neighborhoods also gentrified by not building much if any new housing. West Oakland is heading for project-driven gentrification, but that’s been set in motion well before SB50. California is the nation’s bluest, most progressive state and also the least affordable. The status quo works great for luxury homeowners but not for new generations of the working and middle-class. 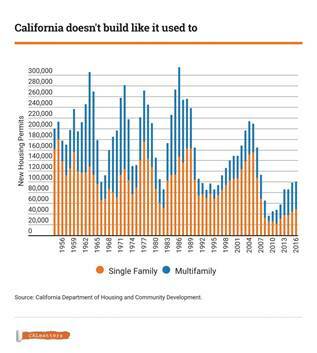 SB50 will not alone solve California’s housing crisis. So long as 75% of families eligible for federal housing assistance are denied such aid, the low-income tenant sector will be in crisis. And the legislature has many tenant protection bills that it should pass to make rental housing more affordable. Yet SB 50 would be a huge step forward for California tenants. If you really want our state’s high-priced cities to have a future of economic and racial diversity, SB 50 deserves your support.